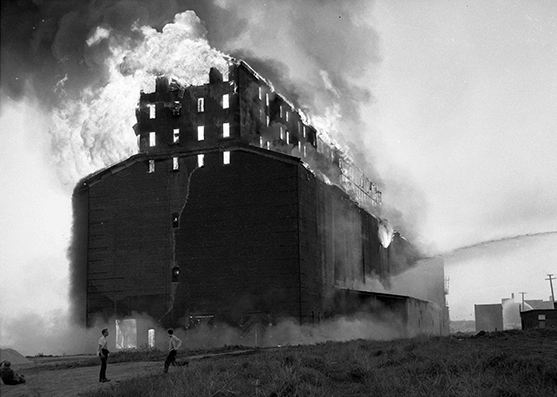 May 25, 1966 –Half of the Chicago Fire Department turns out to fight a fire that destroys an abandoned nine-story grain elevator at Thirty-Second near Throop Street on the South Fork of the South Branch of the Chicago River. Six firefighters are injured as more than 500 firefighters and a hundred pieces of equipment guard against the flames as they threaten a nearby residential area and adjacent commercial buildings. Despite the efforts, the flames, which at their height reach 300 feet, still ignite the roof of the Denver-Chicago Trucking terminal across the river on the west bank. Fire boats are able to quench those flames before they do serious damage. Flames also attack an eight-story industrial building a half-block down the east bank of the river, but hook and ladder crews douse those flames as well. Ten railroad box cars on nearby tracks cannot be saved from the flames that were so intense that onlookers wear protective clothing to watch the inferno. The first alarm at the former Continental Grain Company elevator comes in at 7:10 p.m. and within 20 minutes five more regular and four special alarms are called. May 25, 1950 – A normal run on the newest of Chicago streetcars, the “Green Hornet,” turns into tragedy at the intersection of State Street and Sixty-Third Street when the streetcar slams into a gasoline tank truck, causing an explosion and fireball that kills 34 people and injures another 50. Proceeding south on its State Street route, the streetcar with driver Paull Manning at the wheel is whizzing along at about 35 miles per hour, approaching the intersection of Sixty-Third Street. Throughout the day, though, streetcars have been routed east onto Sixty-Third Street because of a flooded viaduct a block ahead on State Street. At Sixty-Second Street a flagman frantically signals Manning to slow down for the open switch, but the driver either does not see him or ignores the signal. Then the unthinkable happens. A gasoline truck pulling two tanks is travelling north on State Street and enters the intersection just as the speeding streetcar lurches violently through the open switch, throwing passengers to the floor as it hits the cab of the truck, rupturing its gas tank. The streetcar spins around in a half-circle, and as the truck’s gas tank erupts, the cab jackknifes, slicing open the first tanker of gas. Four thousand gallons of gasoline flow from the tank, spilling over the curb and engulfing seven buildings on State Street. Everything is a mass of flame. 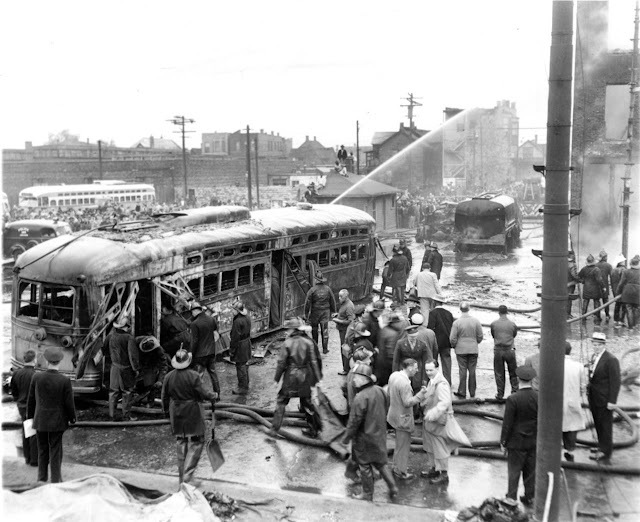 Somehow, 30 people manage to escape the packed streetcar, but 34 people, including the driver of the streetcar and the driver of the truck, die in the inferno. A coroner’s inquest shows among other things, that the doors of this model of streetcar would not open in either direction if just one person was applying pressure to them. That afternoon yielded a scene that was as horrendous as a mass transit accident could ever be. If you have ever wondered why you never see a gasoline tank truck in the city during the day, you can look back on the tragedy of this Thursday afternoon in May of 1950 and understand why. 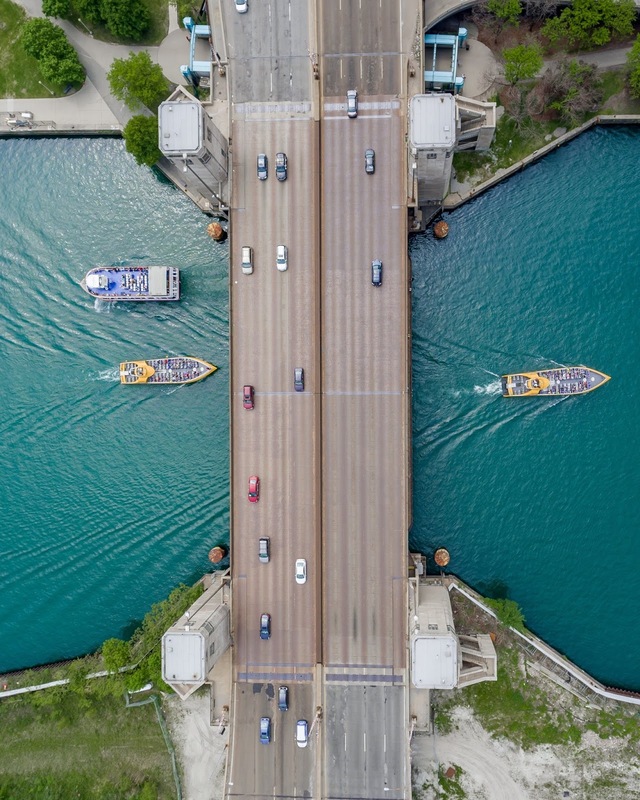 May 25, 1930 – The Chicago Daily Tribune reports that the design for the $10,000,000 outer drive “link bridge” will be the city’s first use of “modern architecture . . . expressive of its function.” [Chicago Tribune, May 25, 1930] President Warren Wright of the Lincoln Park park commission says of the design, “The approved design is a restrained modern treatment, simple, dignified and massive. It is not only in keeping with the present day trends but it is thoroughly practical. Flat stone weathers better, looks better and needs less attention and repair than ornamented surfaces. 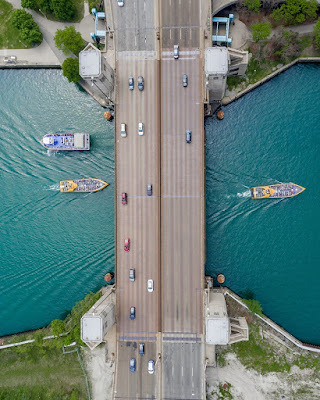 Incidentally, the design gives ample room for the operators’ houses and excellent visibility from them, while its bold and concentrated ornamentation eliminates the need for much overall treatment.” When completed in 1937 the Lake Shore Drive Bridge, one of the most important Depression projects of the Works Progress Administration, is the longest, widest, heaviest bridge in the world. Each of the bridge's 6,240 ton leaves is heavier than any bascule in existence. Today it is a massive example of industrial Art Deco design.